Home / More / Library / List of Medicinal Plants / Auricularia spp. SIMILARLY USED SPECIES: A. auricula-judae, A polytrich, A. sambucina, A. mesenterica, Hirneeola auricula-judae, Tremella auricula, and T. cythiformis. The species found in Hawai’i is Auricularia cornea. COMMON NAMES: Pepeiao (“ear”) [Hawai’i]; mu er (“wood ear”), hei mu er (“black wood ear”) [China], yun erh (cloud ear) [China]; kikurage (edible fungus) [Japan]. PLANT PART USED: The fruiting body (ear). PREPARATION OF MEDICINE: Steamed and eaten, or added in formulas. STATUS IN HAWAI’I: Unknown. Low pest factor. WESTERN FUNCTIONS REPORTED: Antibacterial; antiparasitic; antitumor; antiviral; astringent [Linnaeus]; drying [Linnaeus]; hypoglycemic; immunomodulatory; laxative; lipid lowering; painkiller; reduces mucous; refrigerant [Linnaeus]. 1) Tonifies qi, tonifies the stomach, refreshes the brain, strengthens the stomach. 2) Nourishes the yin and blood, moistens the lung, promoting production of the body fluid. 3) Invigorates blood, cools the blood, stops bleeding. 5) Invigorates blood, stops pain, strengthens the lungs. OTHER MEDICINAL USES • General weakness, compromised immune response. • Numbness. • Excess mucous [China]. USE AS FOOD: In soups or stir-fries with chicken or tofu. They can then be dried at home and later reconstituted with water. Cook well when using as food. OTHER USES: Because of its ability to absorb copper, Auricularia polytricha has been studied as a possible way to detoxify environmental pollution. CAUTIONS AND CONTRAINDICATIONS: DO NOT EAT WILD MUSHROOMS OR FUNGI UNLESS YOU ARE 100% POSITIVE IN YOUR IDENTIFICATION. 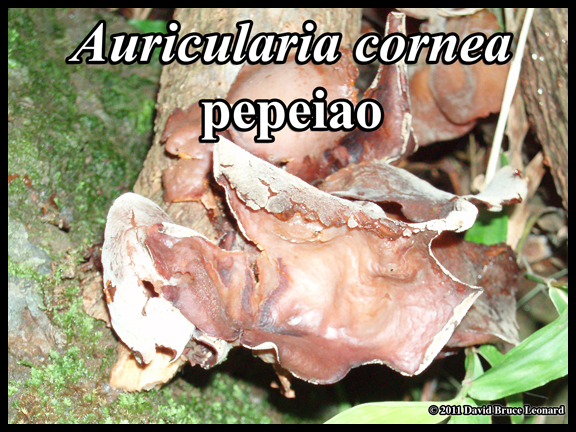 Do not use Auricularia spp. during pregnancy, lactation, or for women trying to conceive. Hippocrates (455 B.C. ), the father of medicine described fungus as being used as “moxa” (the smoke of the burning herb was used topically) for kidney problems or back pain. Auricularia is a microrhizal fungus. Microrhiza create symbiotic (mutually beneficial relationships) with many plant, fern, and lichen members of Hawaiian ecosystems.